Manage and persist your app’s model layer. An instance of NSManagedObjectModel describes your app’s types, including their properties and relationships. An instance of NSManagedObjectContext tracks changes to instances of your app’s types. An instance of NSPersistentStoreCoordinator saves and fetches instances of your app’s types from stores. 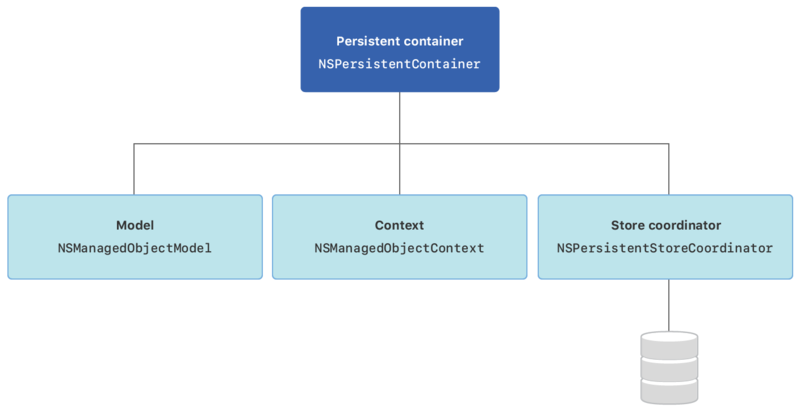 You use an NSPersistentContainer to set up the model, context, and store coordinator all at once. A container that encapsulates the Core Data stack in your application. A programmatic representation of the .xcdatamodeld file describing your objects. An object space that you use to manipulate and track changes to managed objects. A coordinator that uses the model to help contexts and persistent stores communicate. Create a data model file to contain your app’s object structure. Set up the classes that manage and persist your app’s objects.